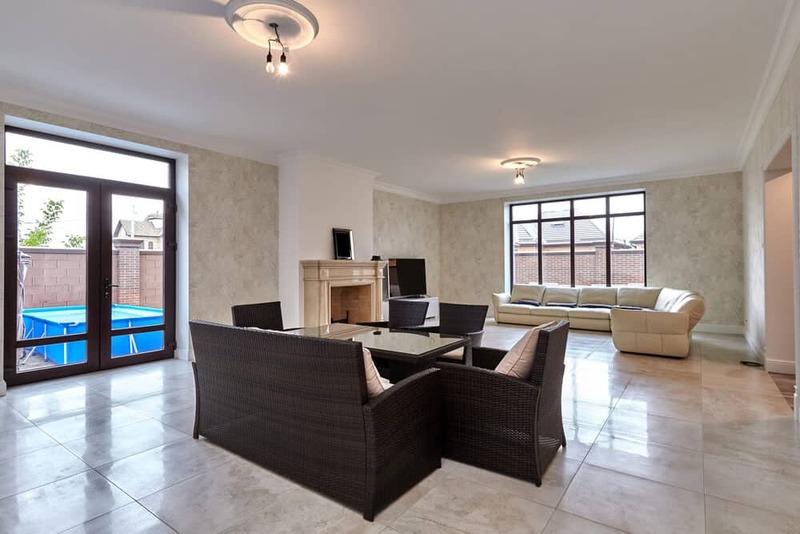 SIP Extensions are a great way to give you and your family extra rooms and space and often means you can stay in the home that you love and avoiding the stress and upheaval of buying and selling a house. A SIP is a ‘structural insulated panel’ that can be used to build new homes, for roofs and to add extensions to existing builds. A SIP Extension is an extension to your home or property using structural insulated panels that are prefabricated, measured and cut prior to the start of the build. The panels consist of an insulating polystyrene core which is sandwiched between two structural facings. SIP’s can be used over the more conventional brick, blocks, or timber frame and there are many benefits of having a SIP extension or roof. Overall, it is a quicker and more effective way to increase the space you have in your property. The SIP framework for an extension can be constructed in as little as 2 days so it significantly speeds up the process of a build and dramatically reduces the cost of the labour needed. In summary, they can be used to create strong, highly energy-efficient extensions and can revolutionise the way you think about extending your home. SIP panel structures don’t have issues with shrinkage or settlement and overcome cold bridging issues associated with other forms of offsite construction. SIPs are thin and compact, taking up less space than other external wall build-ups, which means you can maximise the space you are creating. Whilst the cost of SIP’s is more expensive than using a regular timber frame, there are many advantages to choosing the pre-insulated panels when building your extension and the overall costs of the project and the energy costs will be less when complete. There are many factors that contribute to this and to take into consideration. SIP panels are manufactured in a factory under controlled conditions and pass tight quality control procedures before it is delivered. SIP structures are delivered pre-cut to a specified design and in manageably sized panels making it easy to construct on sites where there is minimal room around the extension or if there is limited access. Because of their high strength to weight ratio, large sections of an extension can be fitted at once, therefore, speeding up the time needed for the initial build stage on site. The Structurally Insulated Panels (SIPs) are typically 1220mm wide and can be as long as 5.1 metres in length to suit each individual project. The panels themselves go up and join very quickly, the panels interlock together with ease and this means the walls and roof of the extension can be constructed within days of the groundwork being completed which results in a significant reduction of labour time being needed for this initial stage, therefore, reducing the cost of your overall build. Due to the speed of putting the structure together, a home extension can be walled and roofed much quicker than other forms of construction making it easier and quicker to knock any walls through with the property always remaining watertight. The drying times when using a SIP structure are also much quicker and this means the building or extension can be fully prepped for electrics and plumbing much more quickly than using traditional construction methods, such as timber frames. As the SIP panels are measured, cut and built off-site in factory quality controlled conditions this means the initial stage of construction is not subject to site weather conditions which can often delay an extension or a building project. A SIP extension is a lot easier to project manage, as you are less reliant on different trades turning up and arriving on the right day and time. Home Extensions can take anything from 8 to 16 weeks or longer, dependent on the size of the extension, the weather, and the speed and reliability of the labour. Often people experience builders disappearing to start other jobs and this makes a project even more stressful. Some SIP extensions can cut build times by up to 70%. The insulation properties of the panels make them super efficient, keeping the warmth in and saving you considerable money on your energy and heating bills during and after the build. The joining systems of a SIP structure offer exceptional airtightness over the more traditional methods and build components used to build an extension. This, along with the insulated panels result in a strong, well designed, warm and eco-friendly extension. SIP’s use much less timber than typical timber frames and are one of the most economical and eco-friendly forms of construction. A SIP extension gives you freedom with your design as the pre-cut panels interlock together enabling you to have different shaped rooms to make the most of your floor space, leaving you with a strong, environmentally friendly design and construction option. They offer versatility over other construction materials, allowing you different design possibilities beyond the conventional; such as sloping roof panels or creating an open space that properly maximises any extension. You can choose the exterior look you want with a SIP extension. Brick slips are the option most widely chosen, however, cladding is also an option with a selection of colours and styles to choose from, or render can also be used and painted in a range of colours. The structural insulated panels are extremely strong and can be used for one and two storey extensions, industrial sized properties adhering to all the required building legislation. SIP panels can also be used to replace bulky loft insulation so are now commonly used to convert a roof space into an area that is useable. SIP panels and structures are used for new build houses, apartments, extensions and roofs and are also used a lot for larger-scale structures and properties such as; Commercial Buildings, Schools, Colleges, Leisure Centres, Housing, Community Centres, Retail Outlets, Hotels, Supermarkets and Hospitals. SIP’s raise no issues when obtaining planning approval for your extension and are now an accepted construction method by local authorities. The ground conditions on your extension site and your design will have an effect on your final planning approval as with any planning application. As with other traditional builds, a SIP extension can have traditional cavity and brick or stone wall, render, brick slips, timber cladding, slate, copper, zinc, stainless standing seam and your external design will be included as part of your planning approval request. We are a professional, reliable and friendly company who can help you build your perfect extension. 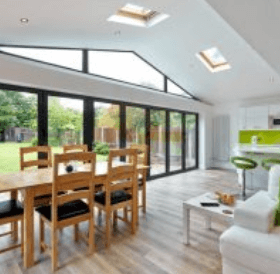 Our team offer support with your design, measurements, building controls and construction of your SIP extension or replacement roof, helping you transform your home into a delightful, warm and useable space for you and your family. Our team are experts in extensions and customer service is at the heart of what we do. We offer an extensive UK network who are all fully trained and approved in the supply and installation of SIP extensions and roofs. We supply high-quality products and will manage the installation of your extension from start to finish, adapting our service to suit your specific requirements. We are leaders in the supply and installation of market-leading SIP extensions with guaranteed performance and competitive pricing. We are committed to efficient installation and our whole team have a commitment to quality, health and safety and the environment. Give us a call on 0845 508 9632 today and one of our team will answer any questions you may have or book a site meeting for you.